New software algorithms have been shown to significantly reduce the time and material needed to produce objects with 3-D printers. Because the printers create objects layer-by-layer from the bottom up, this poses a challenge when printing overhanging or protruding features like a figure's outstretched arms. They must be formed using supporting structures - which are later removed - adding time and material to the process. Now, two software algorithms have been created to address the problem. Researchers from Purdue University have demonstrated one approach that has been shown to reduce printing time by up to 30 percent and the quantity of support material by as much as 65 percent. Such improvements are likely to result in lower overall printing costs, saidBedrich Benes, a Purdue associate professor of computer graphics. "The total cost of printing is governed by numerous factors, including not only the price of the printer but also the amount of material and time to fabricate the shape," he said. Two research papers detailing the new algorithms have been published in the journal Computer Graphics Forum. One paper was authored by Purdue doctoral students Juraj Vanek and Jorge Galicia; Benes; and Adobe researchers Radomir Mech, Nathan Carr, Ondrej Stava and Gavin Miller. Vanek is now working at Samsung USA. Stava earned a doctorate in computer graphics technology from Purdue. The new PackMerger algorithm works by printing a project in segments that can be glued together. 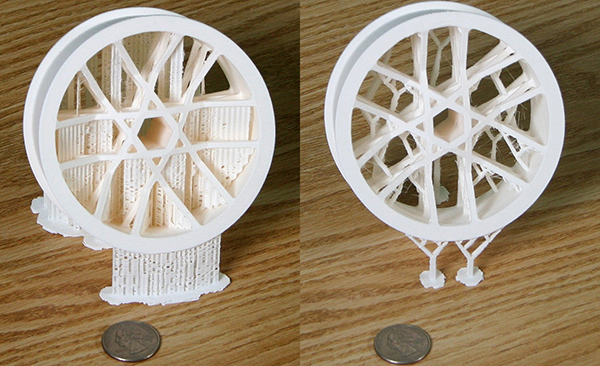 For example, Benes said, printing a model of the Gateway Arch is completed by first dividing the arch into segments before printing. “Our algorithm cuts the project into small elements that will fit into the printing tray,” Benes said. The algorithm determines how to pack the most elements into the smallest possible space using the same principle employed by the Tetris tile-matching puzzle game, in which tiles are manipulated with the aim of creating a horizontal line of blocks without gaps. "To the best of our knowledge this is the first fully working 3-D volume-packing algorithm," Benes said. The algorithm prints the segments so that they are spaced as closely together as possible in the printer tray. Because they are packed together, there is little supporting material between them, saving both time and material. The segments can then be separated and assembled. The algorithm sometimes instructs the printer to produce items nested within each other to save space. Benes and Purdue doctoral students also have developed another algorithm that results in smaller support structures, reducing printing time by an average of 30 percent and the quantity of material by an average of 40 percent. Research findings are detailed in a paper also published in the journal Computer Graphics Forum. The paper was authored by Vanek, Galicia and Benes. Before printing the object, the algorithm determines how it should be oriented on the printer tray so that the overhanging area requiring support is minimized. "The computer automatically rotates the object in all possible orientations before printing to find the orientation that has the smallest overhang area," Benes said. Then supporting structures are built only at certain points within this area, resulting in a scaffoldlike structure that effectively supports the overhangs. The algorithm uses a “geometry-based” method that does not need to consider structural or physical properties when determining how to reduce the supporting elements. "The main advantage of it being geometry based is that it saves time and money and printing material," he said.